District town, on the right shore of the River Fulda in the Prussian province Hessen-Cassel. The Jews settled at Fulda at an early period; a community existed there in the twelfth century. The district is chiefly known on account of the series of massacres which it underwent during the thirteenth and fourteenth centuries. The first took place on Dec. 28, 1238, when the Crusaders, assembled at that time in Fulda, joined by the inhabitants of the town, attacked the Jews and killed 34 men, women, and children. The immediate cause of the massacre was a blood accusation; five boys of a miller having been killed on Christmas-Day, the Jews were charged with the crime. Had not some broad-minded citizens and the magistrate of the town interfered on behalf of the Jews, not one Jew would have remained in Fulda. The Jews complained of the massacre to Emperor Frederick IV., and the latter, compelled to defend the Jews who were considered his "Kammer-knechte," held Abbot Conrad de Mulcoz responsible for it. But the abbot, wishing to exculpate the murderers, sent the bodies of the miller's boys to Hagenau for the purpose of convincing the emperor of the culpability of the Jews of Fulda. Among the martyrs there were several prominent men, some being refugees from France. The names of the victims are given by Isaac b. Nathan in his seliḥah beginning "Attah beḥartanu," and by Pesaḥ ha-Kohen in the first of the three seliḥot which he composed in commemoration of his friends and relatives. In 1309, the plague having ravaged Fulda, the inhabitants of the town, impelled by fanaticism, ascribed its origin to the Jews and killed 600 of them (Trithemius, "Chronicon Hirsaugensis," fol. 566). A third massacre occurred in 1349, at the time of the Black Death. Once again, in the seventeenth century, a Jewish community flourished in Fulda. In 1671 the Jews were expelled from the district, but they were readmitted soon afterward. 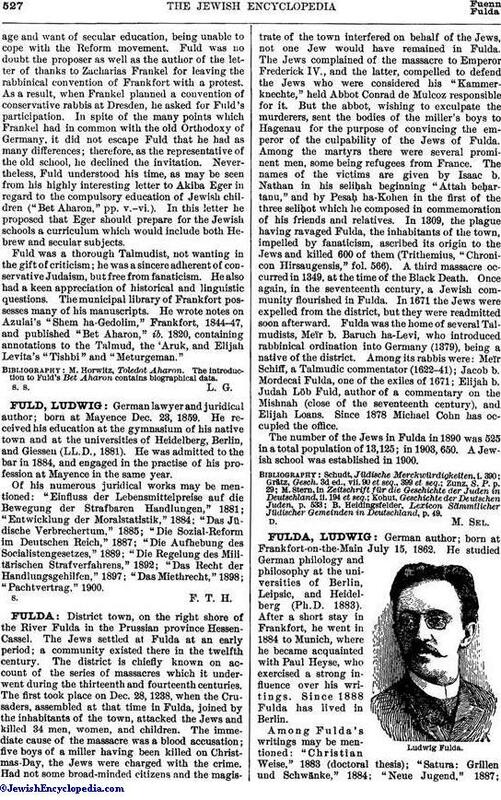 Fulda was the home of several Talmudists, Meïr b. Baruch ha-Levi, who introduced rabbinical ordination into Germany (1379), being a native of the district. Among its rabbis were: Meïr Schiff, a Talmudic commentator (1622-41); Jacob b. Mordecai Fulda, one of the exiles of 1671; Elijah b. Judah Löb Fuld, author of a commentary on the Mishnah (close of the seventeenth century), and Elijah Loans. Since 1878 Michael Cohn has occupied the office. The number of the Jews in Fulda in 1890 was 525 in a total population of 13,125; in 1903, 650. A Jewish school was established in 1900. B. Heidingsfelder, Lexicon Sämmtlicher Jüdischer Gemeinden in Deutschland, p. 49.